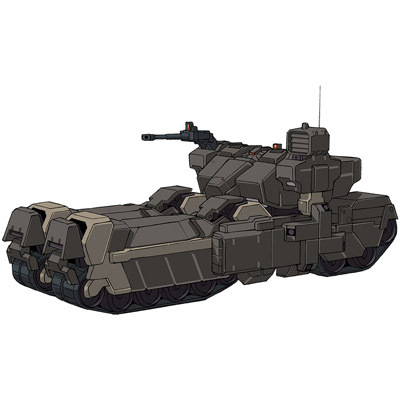 This unit is a transformable mobile suit/tank, used by Earth Federation's Londo Bell and ECOAS special forces; Loto's function is a stealth infiltration unit. As a special operations mobile suit the Loto can take part in a variety of missions. To allow greater versatility the Loto can mount a variety of weapons on its shoulders (or the hardpoints between shoulder and head) including a pair of 120mm cannons, a large Gatling gun, or a smaller machine gun. Its set armaments include a beam burners and a pair of 12-tube missile launchers. Like other descendants of the Guntank, the Loto does not posses standard mobile suit "hands" instead possessing a set of missile launchers. Like its predecessors the Loto requires multiple people to operate. The Loto has two seats reserved for a pilot and a gunner, these seats are located in the upper chest. Located in the lower torso is a third seat likely given to a communications/sensor officer. Both compartments possess separate cockpit doors on the front of the mobile suit. One new feature that sets it apart from its ancestors is how the Loto has a large compartment situated on its upper back, and connected internally to the cockpit, that is designed to hold up to eight armed soldiers, allowing it to act as a small troop transport, which is surprising considering how small the mobile suit is; it can also function as a field headquarters and has a variety of sensors and communications equipment. A second compartment on the lower back, and again connected internally to the upper cockpit, that is used to quickly deploy the soldiers. This transport capability likely explains why the Loto has a smaller low-output reactor. 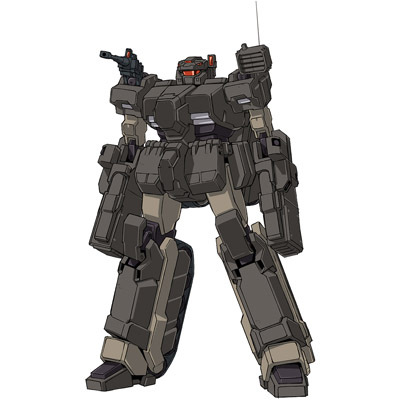 In terms of maneuverability the Loto surpasses its ancestors though it falls short of other mobile suits. With its ability to transform into a mobile suit with movable limbs the Loto can use the AMBAC system allowing for mobility in space as opposed to the Guntanks which were limited to operating as Earth-use attack vehicles. However their limbs are not as sophisticated as other mobile suits which in turn translates into a less sophisticated AMBAC. The Loto also possesses a number of rocket and vernier thrusters, but because of its small size and the fact that so much of its exterior is devoted to other devices such as its wheel treads, the number of thrusters and the size of their fuel tanks are small. While incapable of high speed acceleration or the maneuvers of modern mobile suits the Loto is comparable to older generation machines. Though not designed for combat in open space the Loto performs admirably as a mid to long range support unit in colonies or on asteroids. The Loto was developed by the Strategic Naval Research Institute (SNRI) and its operating data would be used for the development of future miniaturized mobile suits.